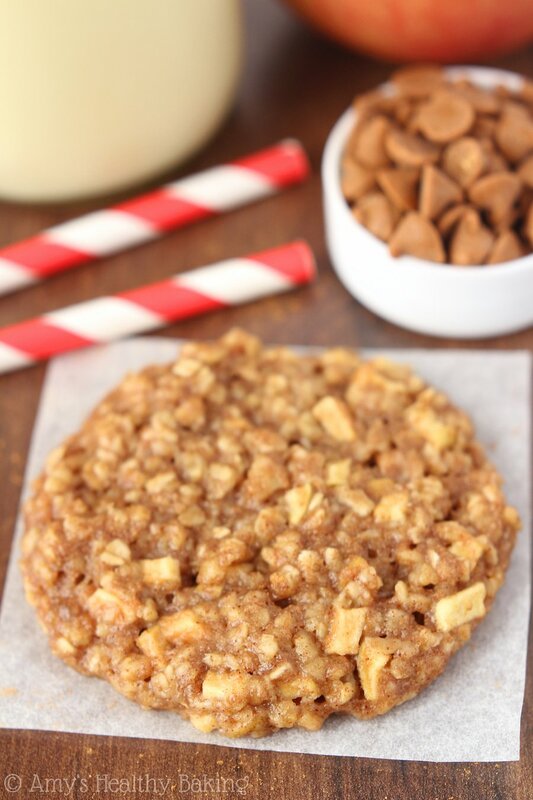 An easy, no-fuss recipe for the softest & chewiest oatmeal cookies you’ll ever make! It’s nearly impossible to stop eating them, but they’re less than 100 calories! When I was 9 years old, my grandma moved from Ohio to California to live in the same town as my parents so we could see her more often. As she settled into her new house, I was giddy with joy. Before, she only visited once or twice a year, but she always brought baked goodies like zucchini or banana bread. With her only 10 minutes away, I thought she’d make those for us at least once a week! My mom quickly explained that no, it was not Grandma’s job to feed us, but Grandma would still bring over homemade goodies every so often. The one I looked forward to the most was, hands-down, her apple pie. She always made a double-crusted apple pie with the flakiest texture on both the top and bottom. The crusts were perfectly golden, without a burned patch in sight, and concealed the tender fruit hiding inside. Grandma usually chose tart Granny Smiths, the traditional option she grew up with. She thoroughly doused them in cinnamon and sugar, then baked the pie until the sliced fruit was supremely soft and nearly falling apart. She usually brought over one of her apple pies on the 4th of July and my dad’s birthday in September, and sometimes when I asked nicely, she would bake one around my birthday too. This past week, in an effort to get back on the healthy track after the holidays, I bought a big bag of apples, but as I stared at them, willing myself to snack on a crisp and juicy one, all I could think of were Grandma’s pies. 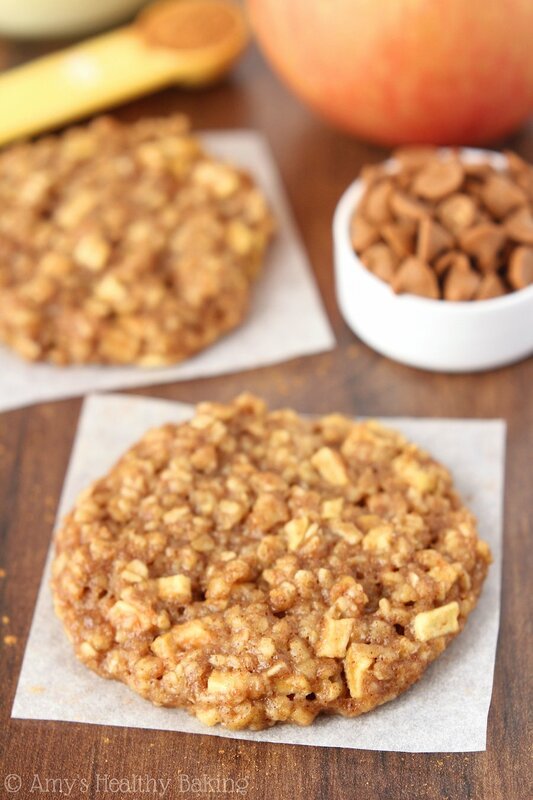 Because I didn’t have the patience for crusts or waiting for hours while it baked and cooled, I made these Apple Pie Oatmeal Cookies instead! Over the past few years, I’ve realized just how much you love cookies. They were your top three choices in the Readers’ Favorite Recipes of 2014! So a new clean-eating recipe for healthy January sounded perfect. Diets shouldn’t be about deprivation, after all! 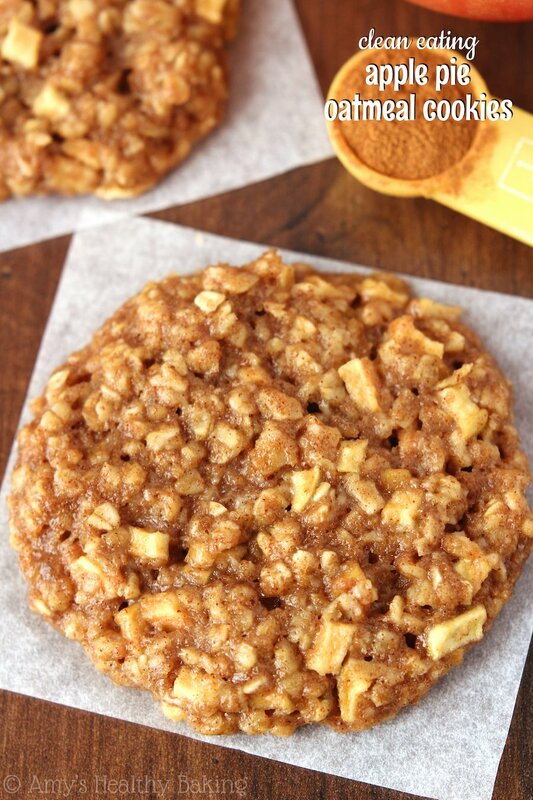 I love my oatmeal cookies to be chock-full of oats, so I actually use more oats than flour. Be sure to use the instant kind because they provide a better chewy texture. And even more importantly, measure them correctly using the spoon-and-level method like with flour! 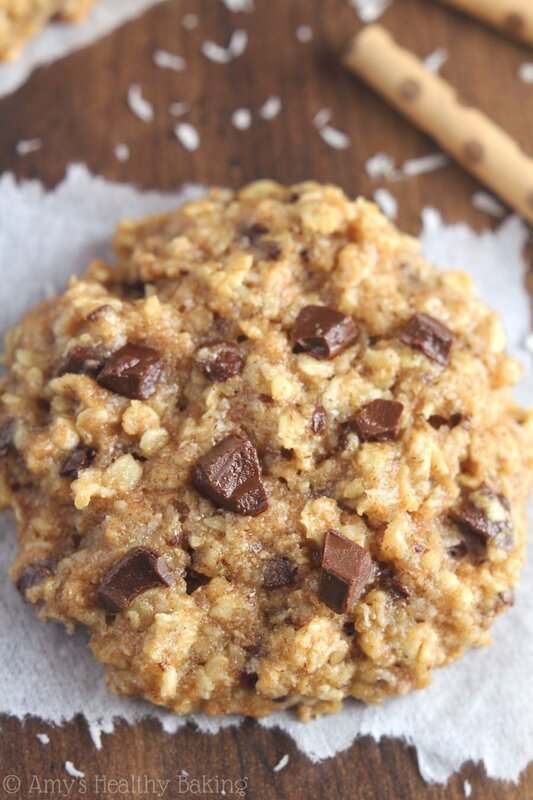 Too many oats will dry out your cookies and make them much less chewy. These cookies are sweetened with agave, but I also included other options in the recipe notes below. Because of the liquid sweetener, chilling is mandatory! If all of the ingredients were measured correctly, the cookie dough should look more like thick muffin batter. Chilling helps prevent the cookies from spreading into thin, flat discs on the baking sheet. Hint: Check out my video for visuals and more tips! 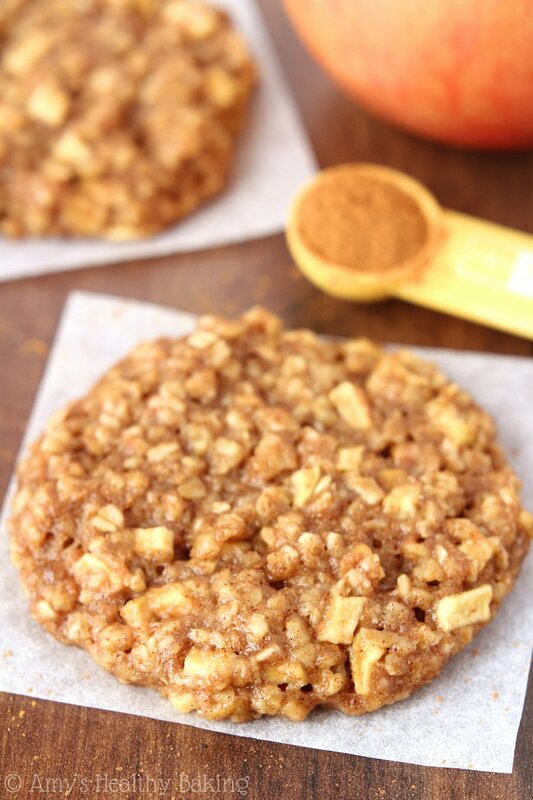 Just like their namesake, these Apple Pie Oatmeal Cookies are full of fruit and lots of warm spices. With this easy, no-fuss recipe, they’re ready much sooner than pie, which makes them a little dangerous! I can’t stop eating them… But at only 97 calories each, I still feel on track for a healthy New Year! 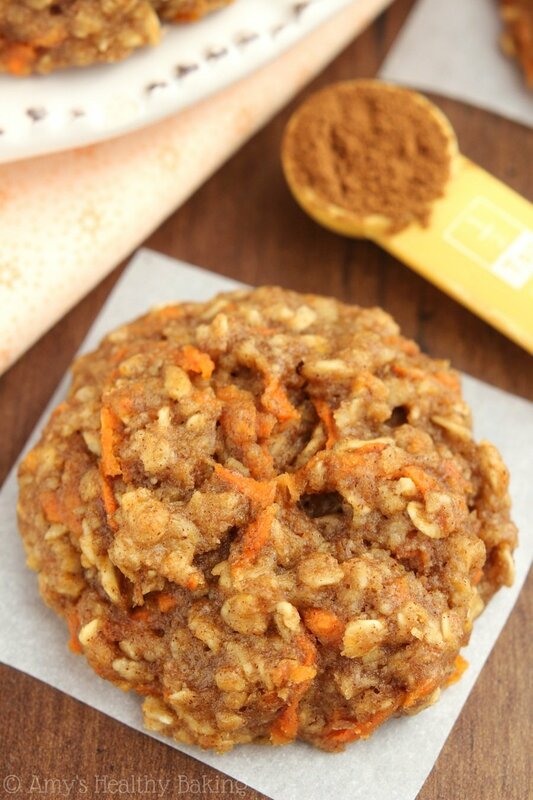 My newly released Healthier Chocolate Treats cookbook is full of sweet and healthy recipes like these oatmeal cookies! Reserve your copy here today! 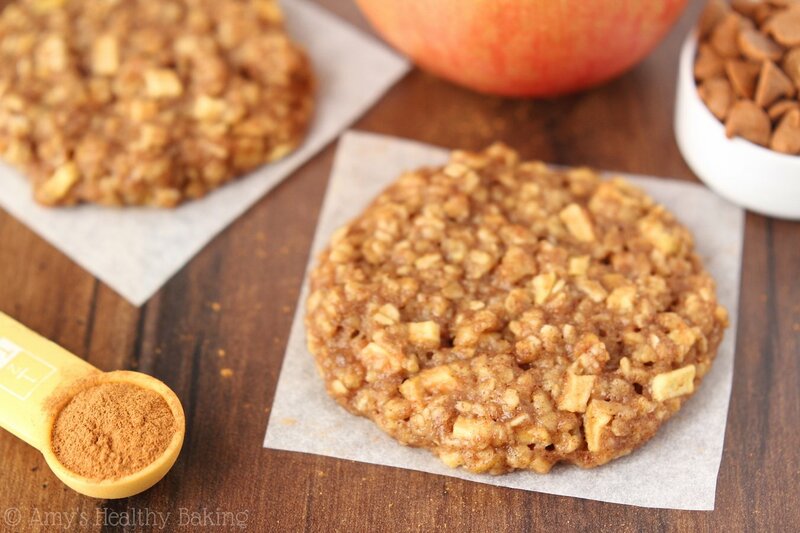 These oatmeal cookies are full of fruit and cinnamon, and they’re incredibly soft and chewy. They’ll stay that way for an entire week if stored in an airtight container—if they last that long! Whisk together the oats, flour, baking powder, cinnamon, and salt in a medium bowl. In a separate bowl, whisk together the coconut oil or butter, egg, and vanilla. Stir in the agave. Add in the flour mixture, stirring just until incorporated. Fold in the apple. Chill for 30 minutes. Drop the cookie dough into 15 rounded scoops onto the prepared sheet, and flatten slightly. Bake at 325°F for 13-15 minutes. Cool on the pan for 10 minutes before turning out onto a wire rack. Notes: It’s extremely important to measure both the oats and flour correctly using the spoon-and-level method or a kitchen scale. Too much of either will dry out the cookies and leave them crumbly instead of chewy. For the best results, dice the apples very finely. The larger the chunks, the crisper and less soft they’ll be. 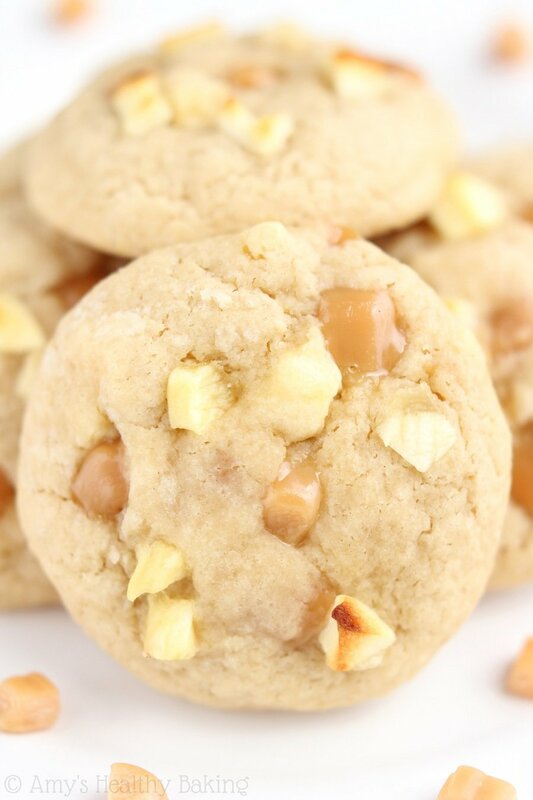 Finely diced apples will not completely soften while baking, but they won’t be quite as crunchy as larger chunks. If the cookies are stored in an airtight container for a few days, the apple pieces will naturally soften over time as well. 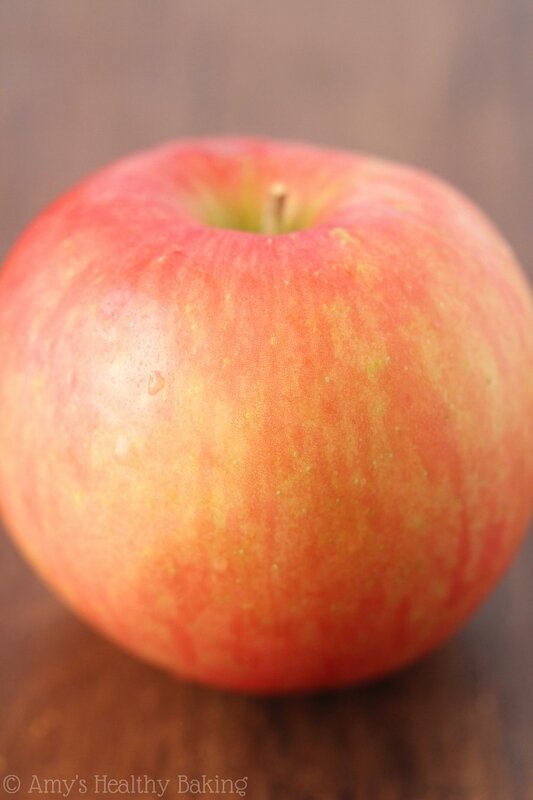 I prefer Fuji apples, but any red apple will work. If you prefer a tarter taste, green apples would be fine too. Honey or pure maple syrup may be substituted for the agave. Alternatively, ½ cup (105g) brown sugar + 5 tablespoons (75mL) milk may be substituted as well. The chilling and baking times stay the same. My cookies still look completely unbaked and spongy at 15 minutes. I did accidentally leave the dough in the fridge for about 45 minutes. Did I chill for too long? I subbed honey and that was the only change I made to the recipe. Just realized it may be the gluten free flour blend I used. They are delicious though! I will make again for my kiddo! I really appreciate your interest in my recipe Amy! I’m happy to help sort out that issue. 🙂 No, that shouldn’t be too long for chilling! How long did you preheat the oven, and did you bake the cookies at 325°F for 15 minutes? Do you have a convection or fan-assisted oven? After letting them cool for 10 minutes on the baking sheet and transferring them to a wire rack, did they taste like they were baked all the way through? This recipe does yield very soft and chewy cookies (not crunchy! ), so that’s just something to keep in mind! These were so good!!!! I used scant 1/2 cup cane sugar instead of the agave since that’s what I add and added about 1/2 cup of unsweetened vanilla almond milk to balance out the liquid. I used 1 flax egg (1T ground flax whisked into 3T water) instead of an egg. I also added 1/3 c chopped walnuts. I didn’t chill the batter due to not using agave and smooshed down each of the cookies a little before baking. Baked at 350 for about 15 min each. I’m so glad you enjoyed these cookies Shannon! That means a lot to me! 🙂 Thanks for including your recipe modifications — I always love hearing what tweaks work! I made these cookies today with honey instead of agave and they were good. I chose to make a small amount of icing with heavy cream and powdered sugar to drizzle on them to make them even better. My son gave a two thumbs up! He’s a tough critic when it comes to cookies. Thank you for posting this recipe. FANTASTIC! I used honey instead of agave.The tip about making sure the apple is finely diced was very helpful. They turned out perfectly. I love the texture; soft but not crumbly. I ate them plain, while the husband added caramel drizzle and ice cream. We both agree that they are delicious. Thank you for creating and sharing this recipe! Can i cut down the amount of honey (using this instead of agave) eg 100ml? Should I add on anything to make it into 120ml in total? Thank you so much for the recipe! It is simple and delicious!!! Tried it once, loved it so I decided to make it again, but doubling the quantity 😀 I was wondering what’s the best way to store them to keep its freshness.